You’re the winemaker today! 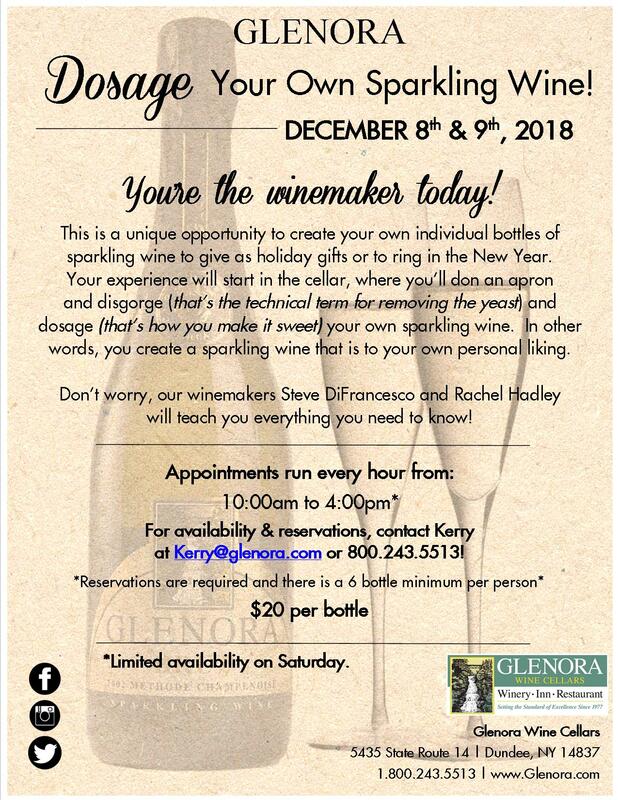 This is a unique opportunity to create your own individual bottles of sparkling wine to give as holiday gifts or to ring in the New Year. Your experience will start in the cellar, where you’ll don an apron and disgorge (that’s the technical term for removing the yeast) and dosage (that’s how you make it sweet) your own sparkling wine. In other words, you create a sparkling wine that is to your own personal liking. Don’t worry, our winemakers Steve DiFrancesco and Rachel Hadley will teach you everything you need to know! Reservations are required and the cost is $20 per bottle and there is a 6 bottle minimum per person. Appointments run every hour from 10:00am to 4:00pm; limited availability on Saturday. For availability & reservations, contact Kerry at Kerry@glenora.com or 800.243.5513.